An Elk Grove man is being held on four felony charges at the Sacramento County Jail following his arrest on Friday afternoon. 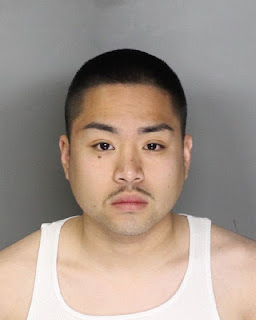 The suspect, 22-year old Tommy Nguyen (pictured above) was stopped by Elk Grove Police on the 8400 block of Enzo Way and was found to be in possession of an unspecified controlled substance. A subsequent search of Nguyen's residence led to the discovery of a handgun and indicia of narcotics sales. Nguyen is being held on a $1,000,000 bail but is not eligible for release because of the seriousness of the charges. The four felony charges include sales of drugs within 1,000 feet of a school and sales of drugs while in the possession of a loaded gun. Nguyen is scheduled for his arraignment tomorrow afternoon. UPDATE 3:30 p.m. - The suspect's age was incorrectly reported as 37. The correct age is 22. Pushing? The journalism isn't strong with this one. Elk Grove Thriving. It's Grow Time!